We all know that babies don't really need shoes, but when you find an adorable pair that you just can't pass up you HAVE to get them. Babies are cute in shoes, that's for sure! When I came across Wooliewares I just knew I had to have a pair. I contacted her the end of February, so we opted to get a pair of boots! Box was a little crushed, but everything was fine! She included a little fox for Avery! Don't they match the duckies perfectly? We got the faux suede boots in brown with cream fur lining. They are so soft inside and out! He wore these a few times and got so many compliments on them. They are just super adorable and are cute with pants tucked in or left out. I wish we would've gotten these towards the beginning of winter so he could've worn them longer. He only wore these like 3 times before it got too warm :( It's almost 60 today again so I really don't think he'll get to wear them anymore. I'm super sad about that. We got the 3-6 month size which is 4 1/4" long. They fit him great then. Had some growing room, but overall fit good. They still fit him now. When I got them his feet measured about a 4" and now are closer to a 4 1/4" but still fit great. They are made very well. I just love how simple, yet beautiful they are. She does wonderful work. If she had more spring shoes when I came across her site, I definitely would've gone for a pair of those. Check these out for girls! She has some really cute stuff. I'm sad we can't wear our boots anymore, but they were adorable while they lasted! Price: Her Fox is $10!! The boots I received are $25. Those girls shoes are $24. These are all very reasonable prices! I would buy either the Wool Felt Hedgehog Softie or the Wool Felt Fox Softie. 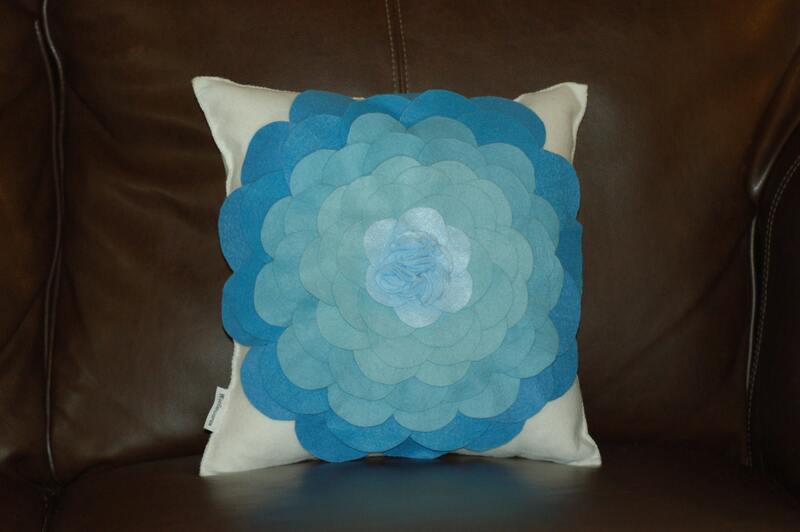 I think I might get the hedgehog wool felt softie! I like the wool felt hedgehog softie. I'd get the Gray wool felt baby shoe. 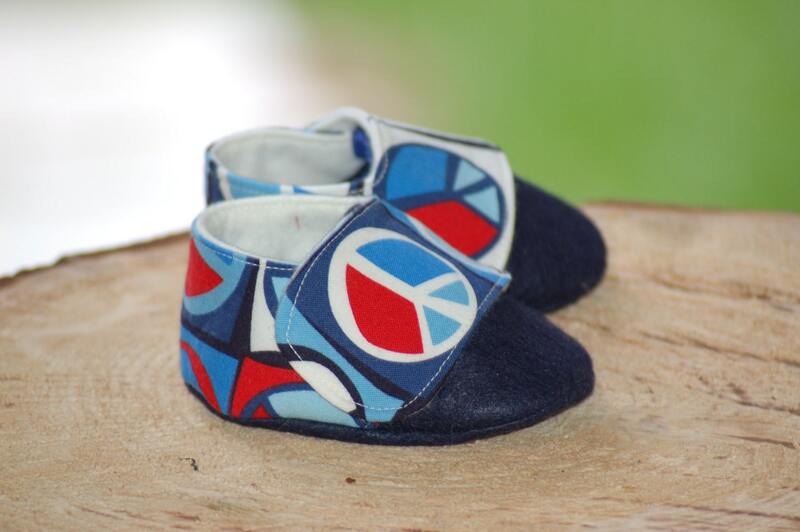 I would buy the Dark gray and navy blue wool felt baby shoes. So cute! I'd buy the wool fox stuffie! 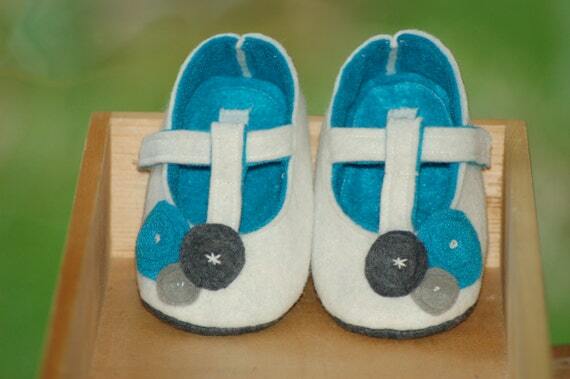 dark heather gray wool felt baby boots lined with blue fleece.